Does Mike Matheny Live A Charmed Life? After Hall of Famer to be Tony La Russa stepped down from the managerial slot in 2011, John Mozeliak tapped Mike Matheny for the job. All he brought to the spot was the knowledge of a catcher and the reputation of being a leader of men. No experience in the big chair, as it were. In 2012, we watched and railed as Matheny bunted anytime there was a runner on first and second. While we knew he’d have to grow into learning tactics, it still seemed so frustrating and counterproductive. He also came within a game of the World Series. In 2013, we watched and railed as Matheny still bunted, though seemingly less often, but then had little idea (to the observers) on how exactly to use a bullpen. He also came within two games of a World Championship. Here we are in 2014. The tactics are still under fire, the bullpen usage is better but not perfect and now we can add to the list of complaints and charges questionable usage of the players that he has. We’ve seen Allen Craig traded because, in part, Matheny wouldn’t stop playing him over Oscar Taveras. We’ve seen Peter Bourjos buried quickly on the bench. He also has the team within two games of the divisional lead in mid-August. There’s a saying, “God takes care of fools, little children, and the United States.” We’ll be generous and say that Matheny the manager counts as the second given his lack of experience. Whatever the case, though, there seems little doubt that Matheny could walk out into a pasture filled with manure and find the one four-leaf clover that is out there. If you doubted that, just look at last night’s game. First, the lineup. The Padres came in hitting .225 so apparently Matheny wanted to make them feel right at home, running out four hitters that are hitting worse than that mark. Yes, the Padres were sending out Eric Stolts, who was a left-hander. However, he’s not necessarily a GOOD lefthander. Benching every lefty you have worked better in the TLR era, when the bench was actually passable. Of course, you can make arguments for the lineup. Jon Jay still has a bit of a wrist problem. Kolten Wong could use a day off. However, it seems a bit overkill to try to solve the platoon disadvantage by running out guys that can’t, for the most part, hit anyone, no matter what hand they throw with. So, of course, the Cardinals get out in front 2-0. Note, however, that it had nothing to do with the bench guys playing. Adams, the only lefty in the lineup, got a hit and Peralta hit a home run. 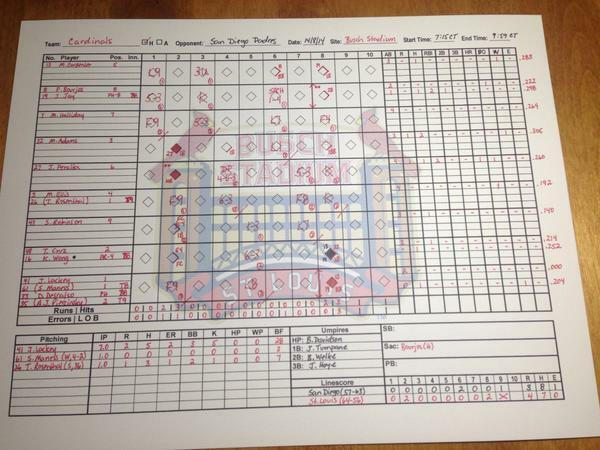 In fact, until the wild and woolly end of the game, the lefty had half the team’s four hits. Perhaps keeping everyone that hit from the port side away from the lineup was a bit overkill. John Lackey ran into some command issues in the sixth, loading the bases with nobody out on a double sandwiched between two walks. He allowed two of those guys to score and the game was tied. Given these two offenses, there was a very good chance this was going to be a late night. I was watching the game via GameDay on my phone so as to not to disturb the family and I saw that Cruz struck out, then got a hit. I chalked that up to a glitch in the app until I checked Twitter. Watching the video this morning, it’s fairly obvious the Cardinals caught a break. Cruz didn’t hit that ball and, for once, Bob Davidson’s questionable umpiring comes around to help the Cards. For some reason, given all the different possibilities on the bench, Matheny chooses Daniel Descalso to pinch-hit. Thankfully, he doesn’t see anything close and trots to first while Wong comes in to pinch-run for Cruz. Carpenter singles to load them up. Alex Torres, the left-handed reliever who had nothing, leaves and righty Nick Vincent comes in. With a lefty no longer on the mound, Matheny now uses Jay to pinch-hit. Of course, as most everyone on Twitter knows, this year Jay actually has a reverse split. He’s hitting better against lefties (.421 with a .985 OPS) than righties (.267 with a .700 OPS). Bourjos also is the opposite of what you’d expect, with a .242 BA/.674 OPS against righties and a .193 BA/.591 OPS mark against the lefties. Now, sure, Jay has a better mark against righties than Bourjos does and so the move could make sense based on that, but if Matheny was paying much attention to that it seems unlikely Bourjos would have started the game. Given the charmed life Matheny is rolling with, Jay of course hit the first pitch for a two-run double. The ninth is Trevor Rosenthal‘s spot, especially in a two-run outing. We’ve noted before how rough his numbers are when he’s used in back-to-back days. With 0 days of rest, Rosie has a 3.93 ERA, is 0-4, and walks about half as many as he strikes out (25 K/13 BB). For comparison, with one day of rest the ERA drops to 2.92 and he strikes out three times as many as he walks. You wouldn’t think that getting one out yesterday made that kind of difference, but given the results of last night, you can’t rule it out. Rosenthal got one of the first three batters out and even that was a well-hit ball that Robinson corralled. Even with a two-run lead, it looked like there was going to need to be some real luck to get out of this one with a win. Matheny’s charmed life struck again. A base hit by Jake Goebbert drove in one but the runner on second tried to score as well. Robinson’s throw was well up the line and A.J. Pierzynski threw a tag on him (or did he?) and Davidson called him out. Nobody was sure that was the case, so they all kept trying to score/tag after that, which didn’t help. Replays were pretty inconclusive and the call stood. Rosenthal then walked the next guy before striking out the final batter, locking down yet another save. That’s what’s important, right? Crazy, crazy game. You’d like to think it didn’t have to be that way if the offense could have come around earlier. That might be a bridge too far for this team, however. Let’s see, let’s give the Hero to Jon Jay for the big double and the Goat has to be Trevor Rosenthal because, while he got the save, he didn’t pitch well at all. Though Ellis with his 0-4 would be right in the mix. As noted, Taveras not only sat last night but never saw the field. Matheny before the game was quoted as saying Oscar has “a lot to learn” as he pointed out his baserunning error from Wednesday night (an error that wound up being moot when Justin Masterson picked him up). While it’s nice to know that Matheny acknowledged that Taveras has been receptive to the comments he’s getting and he probably did need a day off last night, it still rubs me slightly the wrong way for this kind of stuff to be out in the media. Matheny’s sole skill set when he got this job was being able to manage people and this seems a bit counterproductive to that. I’ll freely admit, though, that it’s probably just me and it may come across worse in text than if you were there listening to Matheny. (Then again, basically everything sounds the same when you listen to Matheny. If Phineas and Ferb have Major Monogram, Matheny could be Major Monotone.) Still, it just seems like something that could be handled internally, or at least some positive examples coming out with the negative. Yadier Molina did some catching yesterday, which would seem to be a great sign. Granted, Pierzynski has shored up that spot much more than we ever thought when Molina went down, but he’s not Yadi. It’s nice to know that might be closer to eight weeks than 12 that we’ll be missing him and that he could get some regular season time to get readjusted before the playoffs happen (if this team gets there, of course). Tonight, Lance Lynn tries to hold down the offensively inept Padres. Granted, Lynn doesn’t need a weak lineup to have a good game and it would seem likely that he’ll keep the score down this evening. He allowed just one run in six innings the last time these two teams met. Of course, it’s the rare game where you can call another team “offensively inept”. The Cards will have to show they can hit against Tyson Ross, who is on quite a run. His last 10 games, he’s got a 1.75 ERA and has struck out 70 while walking 16. His last game was against the Pirates, where he garnered a win by allowing just two runs in six innings. He also saw the Redbirds when they were out at Petco and gave up a run in six innings. He did walk five in that game, though, so maybe the Cards were a little more patient than other squads. Or he just had an off day. This could be a game decided by the bullpen or an extra-inning affair. Someone’s got to win it, though. Might as well be the Cardinals.